Penbeili Mawr Farm Holiday Cottages01239 851703work Self-cateringWe aim to provide clean, comfortable cottages with the little extras that make the difference and a home from home. We encourage our guests to enjoy and explore our farm and the woodland walks, enjoy the nature and wildlife and create memories with loved ones. Our cottage breaks will cater for everyone, whether you are a newly wed couple on honeymoon, a keen fisherman or woman, a lover of the great outdoors, a foodie, a family looking for quality time together, an explorer of local towns and villages, a culture vulture or just someone looking for a getaway from the hustle and bustle for a bit of peace and quiet, or perhaps all of the above! Whatever your idea of a holiday, Penbeili Mawr is a perfect base in which to begin. Coast and Country on your doorstep. Cowshed Cottage is a cwtchy one bedroom cottage that stretches languidly over one level. An enclosed garden sits at the front of the cottage, and a small private courtyard is accessible to the rear. Parking is available at the front for two cars. 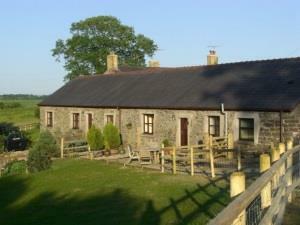 Stable cottage sleeps four people comfortably, with a spacious master bedroom and twin bedroom running along one level. The theme throughout all of the cottages at Penbeili Mawr is mellow stone and wooden beams, a casual country vibe that suggests relaxation and a home away from home, and Stable Cottage is no exception. With parking for two cars and a large garden perfect for children to run and play in, this is another perfect family location. Dairy Cottage, our three-bedroom property stretching over two levels. This property has a private parking space for four cars, leading to the secure garden perfect for children to play in, and a gravel path that meanders up to your front door.